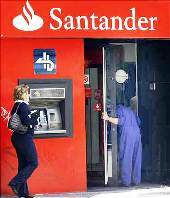 Financial major Santander has announced that it is closing its call centres in India and bringing it back to the UK since it was the main demand of its customers. It is the second British company to bring back its call centre work from India this month. New Call Telecom, which competes with BT and Sky to offer home telephone services, broadband and low-cost international calls, earlier said it was bringing back its outsourced work from India because operating there was no longer cheap. Santander chief executive Ana Botin told the BBC: "This is what our customers have told us is the most important factor in terms of the satisfaction with the bank, and we have listened to them and decided to bring all of our retail call centres back from India." Many British companies outsourced work to India where costs were low. But in recent years, increasing prices in India have made it a less attractive option than retaining the work in the UK, according to reports. New Call Telecom is opening a call centre in Lancashire after being attracted by low commercial rents and cheap labour costs. New Call's chief executive, Nigel Eastwood, said: "We did a cost and service analysis of returning home and there was an absolute parity between what we are paying for a third-party call centre in India and here in the UK." Eastwood said that using British staff will also cut costs in the average amount of time taken to deal with customer inquiries. "The average handling time in the UK is three minutes. But if you go out to India, you need to add another minute unless it's a very efficient operation, so that means we can actually reduce the head count with the saving," he said. He added that in India in the past decade, as call centres have grown, real-estate prices have gone up massively, while salaries have also crept up. New Call will pay 4 pounds a square foot for space in Burnley, which Eastwood says is similar to that in Mumbai and New Delhi. "Salaries in India aren't that cheap any more. Add to that the costs of us flying out there, hotels and software, and the costs are at an absolute parity. In the UK we will pay workers the minimum wage," Eastwood said. "Given the current economic environment, we will get good sticky employees who will also receive bonuses linked to performance," he added. The use of foreign call centres has proved unpopular with many customers, who say they prefer to deal with British staff, the report said.